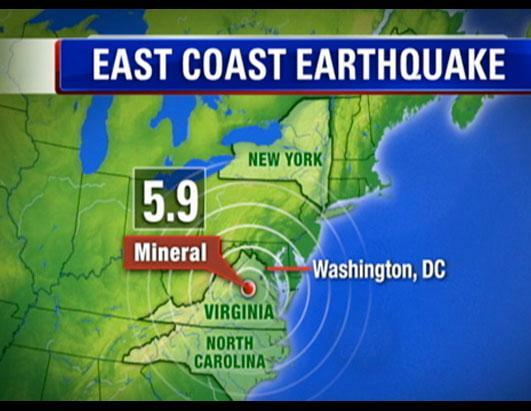 RICHMOND, Va. — Data from the 2011 earthquake centered in Virginia shows East Coast tremors can travel much farther and cause damage over larger areas than previously thought, the U.S. Geological Survey said Tuesday. The agency estimated about one-third of the U.S. population could have felt the magnitude 5.8 tremor centered about 50 miles northwest of Richmond, which would mean more people were affected than any earthquake in U.S. history. Scientists also found the quake that caused more than $200 million in damage triggered landslides at distances four times farther and over an area 20 times larger than research from previous quakes has shown. “Scientists are confirming with empirical data what more than 50 million people in the eastern U.S. experienced firsthand: this was one powerful earthquake,” USGS Director Marcia McNutt said in a news release about the findings presented at the Geological Society of America conference in Charlotte, N.C. Researchers used landslides to see how far-reaching the shaking from East coast earthquakes could be. The unexpected jolt cracked the Washington Monument in spots and toppled delicate masonry high atop the National Cathedral. The shaking was felt from Georgia to New England. According to the findings, the farthest landslide from the quake was 150 miles from the epicenter, a greater distance than any other similar-sized earthquake. Previous similar quakes have resulted in landslides no farther than 36 miles from the epicenter. Additionally, the landslides from the 2011 tremor occurred in an area of about 12,895 square-miles – about the size of the state of Maryland. Previous studies indicated an area of about 580 square-miles – about the size of Houston – from an earthquake of similar magnitude. Geologic structure and rock properties on the East Coast allow seismic waves to travel farther without weakening compared with the West Coast, Harp said. He said equations used to predict ground shaking might need to be revised now that scientists know more about the power of East Coast earthquakes. The information also will help with building codes as well as emergency preparedness, the USGS said. While West Coast earthquake veterans scoffed at what they viewed as only a moderate temblor, the August 2011 quake changed the way officials along the East Coast viewed emergency preparedness. Emergency response plans that once focused on hurricanes, tornadoes, flooding and snow are being revised to include quakes. Some states have enacted laws specifically related to the quake, and there is anecdotal evidence of a spike in insurance coverage for earthquake damage.